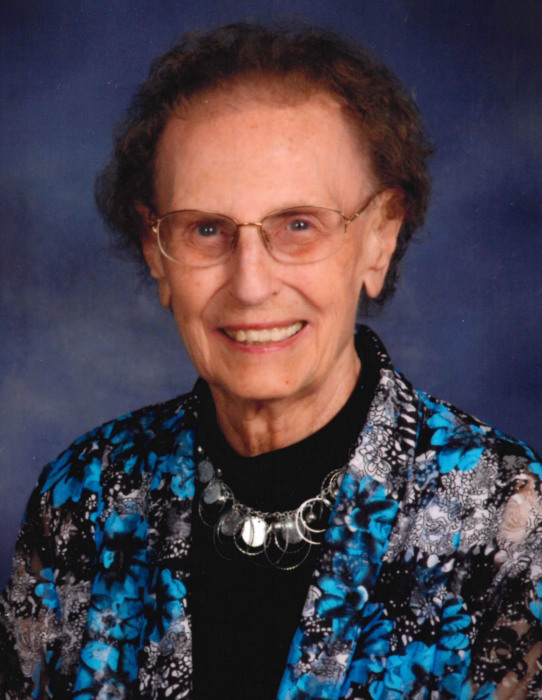 D. Arlene (Baker) Funk, 91, of Newton died on Palm Sunday, April 14, 2019, at the Comfort House in Pella. A funeral service will be held at 11:00 a.m., Thursday, April 18, 2019, at the First United Methodist Church in Newton. The family will greet friends from 5-7 p.m., Wednesday, April 17, at the Wallace Family Funeral Home and Crematory. Memorials to the First United Methodist Church may be left at the church the day of the service or at the funeral home. D. Arlene Baker, was born on a farm southeast of Ira on August 13, 1927, daughter of Clifford and Grace (Frey) Baker. She attended country schools in Jasper County and was a 1945 graduate of Mingo High School. Arlene taught in a rural school in Mound Prairie Township for two years (1945-1947). She married Richard Crozier in November of 1946 and they farmed near Mingo. After his death in 1948, Arlene moved to Newton and was employed for six years at the Iowa State Employment Service. On June 20, 1952, Arlene was united in marriage with Jerry Eugene Funk in the chapel at the First United Methodist Church in Newton. To this union were born three children, Vicki, David, and Nancy. Arlene provided day care in her home for several years before accepting secretarial employment at Washington Elementary School for five years. After the closure of Washington School, she became secretary at Woodrow Wilson Elementary School for ten years, retiring in 1985. She was a member of the First United Methodist Church, United Methodist Women, Sunday School teacher, PTA member and officer, 4-H and Campfire leader, Newton Square Dance Club and Flutterwheelers RV Camping Club. She was active in the Skiff Hospital Auxiliary and enjoyed volunteering in the hospital gift shop. She enjoyed her time participating in the Senior Center Monday Craft Club. Arlene liked spending time with her family, making many crafts and decorations out of plastic canvas for holidays and special occasions, square and round dancing, reading, and traveling. Those left to honor Arlene’s memory are her children, Vicki (Keith) Rudd of Johnston, David (Suzanne) Funk of Newton, and Nancy (Steve) Tommeraasen of Spencer; her grandchildren, Heather (Nate) Erickson of Firestone, Colorado, Tiffany (Andy) Schmeisser of Waukee, Ryan Funk (Rosie Lancaster) of Altoona, Brandon (Nana) Funk of Houston, Texas, and Chelsea (Brandon) Dunkerson of Newton; step-grandchildren, Lena (Aaron Alcott) Tommeraasen of Ames and Sara Moore of Eugene, Oregon; her great-grandchildren, Ethan, Connor, Anna, Hayden, MaKenna, and Julian; and her step-great-grandchildren, Mackenzie and Madison. She is also survived by her sister, Marilyn Kuch of Boston, Massachusetts and many nieces and nephews. She was preceded in death by her husband, Jerry and her parents, Clifford and Grace Baker.